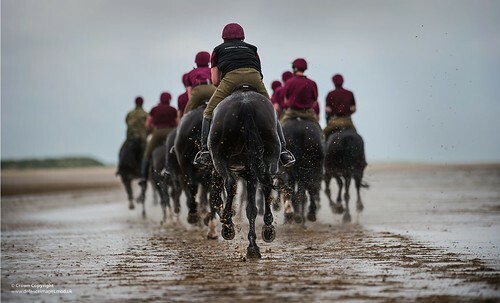 The horses of Household Cavalry Mounted Regiment (HCMR) are exercised on the beaches of North Norfolk. This image was a runner up in the Army Photographic Competition 2013. 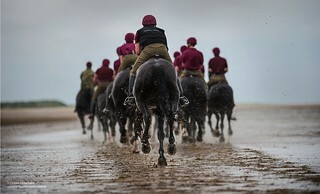 The Household Cavalry Mounted Regiment (HCMR) is the most senior Regiment in the British army. It consists of The Life Guards formed by King Charles II in 1660 and the Royal Horse Guards (Blues) and 1st (Royal) Dragoons who were formed in 1661. The men of this Regiment spend time throughout their army career with both the HCMR and the Household Cavalry Regiment (HCR) which is a formation reconnaissance regiment providing the ears and eyes for the army Ð essentially swapping between armoured fighting vehicles and horses. There are units of the HCR currently deployed in this role in Afghanistan. The HCMR is world re known for their Ceremonial duties in Central London resplendent in their tunics (red for the Lifeguards and Blue for the Blues and Royals), Albert pattern helmets adorned with plume (white for the Lifeguards and red for the Blues and Royals) and 1892 pattern swords which saw action during the Boer War. 2013 has seen another busy year for the men and horses who have taken part in a packed Ceremonial season in central London with amongst other high profile events State Visits, Windsor mounts, Beating Retreat and the QueenÕs Birthday Parade. HCMR are usually housed at Knightsbridge Barracks but have temporarily moved 120 horses and 160 men to West Tofts camp located close to Thetford, Norfolk which will be their temporary home for 2 ? weeks whilst they conduct their Regimental Training camp. The temporary up rooting to Norfolk is a long exercised tradition in the RegimentÕs history with what used to be known as a Summer Camp being undertaken throughout its history. In recent decades the Regimental Training camp has been located in and around Thetford and the North Norfolk coast which provides the open space which enables a wide range of training and instruction to take place which is impossible to do in a city environment.